Search.searchjsmtmp.com is a floating browser hijacker, and by that we mean that it does not have an anchor that would connect it to users. 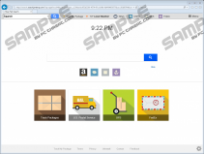 This hijacker was created by Polarity Technologies Ltd., and most other hijackers by this company are officially represented using unique extensions. This is not the case with this strange search engine; at least, right now. It is quite unlikely that the hijacker is currently taking over Mozilla Firefox, Google Chrome, and Internet Explorer web browsers because users are unlikely to download it on its own. That being said, we have analyzed this threat, and we have some useful information for you about it. Without a doubt, we recommend deleting this hijacker, but you can make up your own mind after you read this report. Whether or not you choose to remove Search.searchjsmtmp.com, remember that the comments section is open, and we can discuss things further. There are plenty of hijackers that are similar to Search.searchjsmtmp.com (e.g., Search.searchefc.com, Search.heasysportsaccess.com, or Search.search4ppl.com), but it is most similar to Search.searchtmp.com. 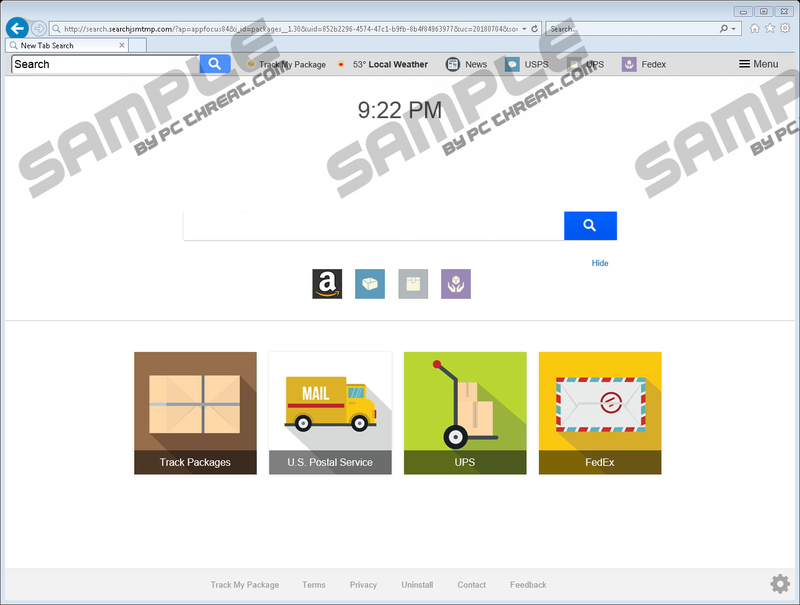 This hijacker is connected to an extension called “Track My Package,” and it can be downloaded from the official download page, trackmypackage.co, or the Chrome web store. The interfaces of both of these hijackers are identical, and Search.searchjsmtmp.com even displays a “Track My Package” button on its interface. Along with it (it offers the “Contact Us” form), the interface also enables easy-access to USPS, UPS, FedEx, and DHL package tracking pages. This is one of the two reasons users might choose to stick with the hijacker even if it slithers in without permission. Although the easy-access links shown via the home page of the hijacker are legitimate, you should not focus on that. Instead, focus on the fact that it redirects to Yahoo Search without permission! In fact, this is another reason you might decide to trust the hijacker, but that would be a mistake. The results are delivered via this popular search engine because you are likely to interact with them. The thing is, they could show sponsored, potentially unreliable content, and that is why deleting Search.searchjsmtmp.com is recommended. Whether or not Search.searchjsmtmp.com entered your operating system along with an extension, there is a good chance that potentially unwanted programs, hijackers, or malware might have slithered in as well. This is why it is crucial for you to find a good malware scanner. This tool can inspect your operating system and determine if there are threats that require removal. Needless to say, you must delete all threats that are found; otherwise, you will never be safe. Even if you choose not to eliminate Search.searchjsmtmp.com – which is not what we recommend – you want to erase the remaining threats. When it comes to the hijacker, we suggest getting rid of it because the only good thing about it is the 4 easy-access links it gives you. Besides that, it tracks information and shares it with third parties that can create scams using it. Also, it redirects to a search engine that you know but cannot trust because of the interposition of the hijacker itself. Also, it does not matter whether it has taken over homepage, search provider, New Tab, or all of the platforms together. It still is an unreliable and useless hijacker, and that is what you should focus on. The instructions below show what to do if Search.searchjsmtmp.com was introduced to you along with an extension. In this case, you need to remove the extension (directly via Chrome and Firefox, and uninstall an application if it takes over Internet Explorer) to get rid of the hijacker itself. The instructions also show how to modify homepage and search provider settings in case you need to delete Search.searchjsmtmp.com on its own. As discussed earlier, employing a legitimate malware scanner is strongly recommended. If anything malicious is found besides the hijacker, you have to figure out a way to eliminate it as well. In many cases, the process can be too overwhelming because of the complexity of the malware that exists. Luckily, anti-malware software is always ready to solve the problem. Install it now, and it will automatically erase all threats. Even better, it will strengthen your system’s protection to ensure that malware cannot invade again. Click Start/Windows logo on the Taskbar and click Control Panel (Windows 8 and earlier) or enter control panel into the field on the Taskbar and launch the tool (Windows 10). Go to Add or Remove Programs (Windows XP) or Uninstall a program (Windows 7 and later). Launch Internet Explorer and then tap keys Alt+T. Select Internet options, click the General tab, and find the Home Page section. Overwrite the hijacker’s URL and then click OK. Tap Alt+T again, select Manage add-ons, and then move to Search Providers. Choose/add the desired provider and click Set as default and then Remove the hijacker. Click Close. Launch the browser and enter chrome://extensions into the address field. Tap keys Alt+F to open the menu on the right and then click Settings. Navigate to the Search engine menu and click Manage search engines. Find/add the desired provider, click the More actions button on the right, and click Make default. Find the hijacker, click the More actions button, and click Edit. Overwrite the hijacker’s URL and click SAVE. Launch the browser and enter about:addons into the address field. Enter about:preferences into the address field. In the menu on the left click Home. Under Homepage and new windows find the hijacker’s URL and then overwrite it. Under Default Search Engine select the desired search provider. Under One-Click Search Engines select the hijacker and click Remove. Quick & tested solution for Search.searchjsmtmp.com removal.